Queues for Cherwell Valley at M40 J10. For most people, services located at junctions will be associated with complicated and overloaded roundabout arrangements which, on a bad day, can turn a brief stop into a long detour. 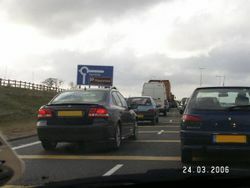 In 2008, the Highways Agency put a stop to this, by saying no more services should be built at junctions unless there is no other option available. They also clarified that they were paying attention to large developments selling fuel and refreshments close to motorways. In 2013, their wording was weakened, and they simply said that if there were two otherwise idential proposals, they would prefer the online option. However, there is nothing to force the offline option to be rejected. 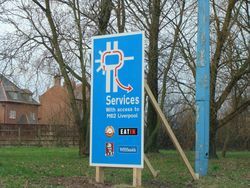 The new wording also described an offline service area as one "sharing a common boundary with the highway", implying that any new proposals for sites not directly alongside the motorway would be rejected outright. In 2017 Applegreen and Moto both proposed several new offline services. In Ireland, the phrase "offline services" is used publicly, with road signs saying "offline services available".